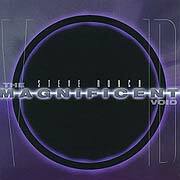 Steve Roach’s restless vision has taken him across some mighty sonic expanses. Alone and with an international band of collaborators he has attempted to find the place where sound comes from, blending synthesizers and early instruments to create a highly original organic brand of modern electronic music. He has looked toward the ancient as a signpost for reading the modern world and vice versa with mystifying accuracy. On The Magnificent Void, Roach tracks the terrain that lies outside the discussion of space, time, and even music. Without the aid of insistent rhythms, Roach takes his electroacoustic investigations into the dark heart of the sonic ooze to find the country that lies within and interpret its languages. The sounds that emanate from his journey are older than form,order or civilization. He interprets them from the experiential realm as a medium. For nearly two decades Steve Roach has been at the forefront of new directions in electronic and acoustic music. His work has consistently confounded classification and genrefication. A true pioneer in his field, he has worked with musicians, filmmakers, artists and photographers across the globe to further the discussion of artistic expression. Younger innovators in the techno and ambient worlds revere Roach’s contributions and are amazed at his ability to stay years ahead of the curve. With The Magnificent Void, Roach ups the ante once again. “The Void,” wrote metaphysician Stanislav Grof, “exists beyond form of any kind. While being a source of everything it cannot be itself derived from anything else. It is beyond space and time.” The Void then, is not something we do, it is something we experience. It is nothingness, emptiness, silence. It is not a state so much as a place of interior geography that nonetheless connects all beings in the phenomenal and archetypal worlds. Since he began recording in 1979, Steve Roach has restlessly and relentlessly pursued a singular course for himself in the electroacoustic field. He has traveled, beginning with his landmark Structures From Silence recording in 1984, through his many solo and collaborative projects (over 30) to this present effort, into the distilled heart of sonic essence itself, and its mirrored double, nothingness, to find the seam where they converge: Silence, from where all sounds emanate and eventually return. The Magnificent Void, then, is for Roach, not a summation, but an entirely new path of musical exploration; it is a benchmark for an already prodigious and celebrated career. The opening track on this disc, the nearly eight-minute “Between the Gray and the Purple,” is, in all of its washes and drones, a locator of distance and environment. Because of its distinct lack of percussion, it is startling. It’s pure drift, full of cascading images and comforting phrases that lull and mystify. For all its wandering and nebulousness, it’s full of emotions that fall on top of one another, gradually becoming a weave of feeling and unknowing; it prepares us for what comes next. On “Void Memory One” (which is at different points in the journey followed by Two and Three), images begin to articulate themselves in fleeting fashion, through the ears to the brain and even into the unconscious, which then begins to speak aloud. The fact that this track is a segue from the previous, and that all the others follow suit, is an accurate reflection of how stillness and silence take their place among us and allow us the freedom to move away from an overabiding concern with the physical world. By the time we slip into “Infinite Shore,” and its segue into “Cloud of Unknowing,” Roach has moved himself into the background, allowing the sound to speak for itself in the heart of the listener. Here, mood, color, modality, nuance, and texture, are all interspersed with space and atmosphere. The stillness, no matter how dark the emotion expressed, is pervasive. After moving across more amorphous bridges, through paths of memory and ghostly presences, where archetypes and sketchy spirits float through the dark drift unbound, we come to, at last, the gateway of “The Magnificent Void.” In Roach’s unobtrusive hands, it comes into view as having always been there, ever present, ever silent, informing the journey at every step, yet never being the thing itself. Like Arvo Pärt’s simple, tinntinnabuli investigations into the mystery of three bells ringing — in order that his music might cross the threshold of heaven — Roach has overcome his accumulated knowledge and placed it under the guidance of the Void’s utterance of the eternal. Innovation is a strange thing, it moves us forward and holds us back; only the true artist can discern the difference between the two, and know when the balance has been tipped. Steve Roach is that artist, unafraid of what the future might hold and embracing that which will grow him out further. Yet he keeps one eye cocked to the lessons of the past as a way of grounding his work; he rejects musical trends and technological fashions as inept fixes to age old problems in the word of organic sonic inquiry. Here, Roach goes to sleep in the questions in order to wake up in the answers. That there could be a record like The Magnificent Void at the end of the 20th century, which refuses complexity and obfuscation for the sake of allowing the primordial to speak freely is remarkable. That Steve Roach, after such a long and celebrated career, can still, without artifice or falsity, articulate this vast yet simple vision, is astonishing. This is the gate, step inside.